It is not just another type of crime, but a form of political violence. I read this article and found it very interesting, thought it might be something for you. The article is called The Rise of Mass Shootings During the Decline of Economic Conditions and is located at https://evonomics.com/the-connection-between-a-poor-economy-and-mass-shootings/. This is the fourth and last installment in this series. To tell the truth, I will be glad to be done with it because shooting rampages is an inherently depressing subject, in more ways than one. However, it is also an important one. Today I need to review the alternative explanations of the pattern I documented in the previous installments. First, a recap. I have argued that indiscriminate mass murder (IMM) has been seriously misinterpreted. It is not just another type of crime, but a form of political violence. More precisely, suicide terrorism. It is not motiveless. But the motive is not to kill a specific person, or persons, but to strike at a social group, at an institution, or at the society as a whole. ‘In-discriminant’ is the key word coding for the Principle of Social Substitution. The rampage shooters see themselves as moralistic punishers striking against deep injustice. In a perceptive opinion at New York Times, Adam Lankford writes, “we should think of many rampage shooters as non-ideological suicide terrorists” (I would remove ‘non-ideological’ because many such killers in my database were ideologically motivated). He then points out that a common factor in both rampage shooters and suicide terrorists is “a deep sense of victimization and belief that the killer’s life has been ruined by someone else, who has bullied, oppressed or persecuted him.” I would add that this ‘someone else’ does not need to be a person (a point that Lankford acknowledges elsewhere in his opinion). In fact in the case of IMM (with an emphasis on the I), it is usually a group, an organization, an institution, or the whole society that are held responsible by the killer. I further argue that the frequency of IMM depends, in the first place, on environmental conditions. As the degree of cooperation in the American society declined over the last four decades, and the degree of intra-societal competition rose, increasingly large numbers of susceptible individuals were victimized, bullied, and oppressed, and a certain (very small) fraction of them chose to become mass murderers to avenge such injustice. The fundamental forces underlying this environmental change have been two structural-demographic trends – widespread impoverishment and elite overproduction (see my article on the Conversation). The first was correlated with the deterioration of working conditions, the second with the growing social pressures on the campus, which is why the two most common settings for shooting rampages are the workplace and the schoolyard. Overall, as the level of cooperation within the society decreased, social competition, political polarization, the dog-eat-dog economic climate, and the general level of nastiness increased (see my blog on this topic). As I am quite sure that some will willfully misread what I am saying, I want to add that while an environmental change may explain why the frequency of IMM increases, it does in no way excuse them. Mass murder is a horribly inappropriate response to even those situations when injustice is real. Mass murderers are insane, evil, or both. Now that I have summarized my explanation, let us consider alternatives. 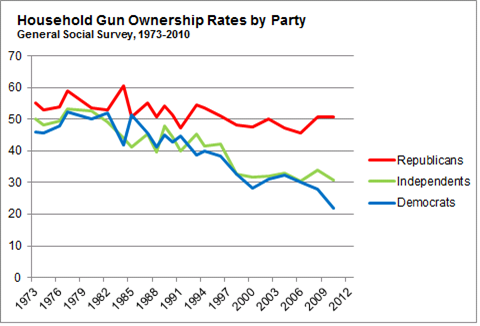 As we can see, gun ownership rates have been declining across the political spectrum, although naturally the Republicans lagged behind the Democrats. 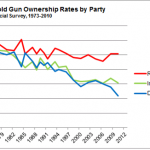 Since the trend in the firearms runs counter to the trend in the frequency of IMM, it does not help to explain why the latter have been increasing. This doesn’t mean that the proposed measures of gun control will be ineffective in reducing IMMs. It seems quite possible to me that if we were to ban all firearms completely, then there will be fewer IMMs. It won’t change the underlying environmental change that explains the motivations of potential rampagers, but it will surely reduce their ability to inflict damage on the society. In the absence of guns they will have to turn other means of inflicting casualties – constructing bombs, using knives, axes, bows and arrows, cars, and planes. 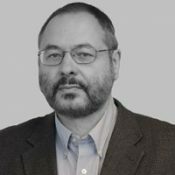 But all those methods of inflicting mass homicide have problems – they are more easily detected by the police, or they inflict lower casualties. So in the absence of guns it stands to reason that a higher proportion of killers contemplating IMM will be arrested before they commit murder, or if they go on rampage, kill fewer people, or even choose to just kill themselves (perhaps in the form of ‘suicide by-cop’) instead of committing murder-suicide. Overall, while these measures will not address the conditions causing the increase in IMM, they will surely reduce the number of innocent people killed. This is one of the most common explanations for the increased incidence of IMM. Here’s an article by Clayton Cramer that lays out the logic in a very clear way (thanks to the reader lrb for supplying me with this link). Cramer says, “At least half of these mass murderers (as well as many other murderers) have histories of mental illness.” The problem with this statement is that it either goes too far, or not far enough. It does not go far enough because can you imagine yourself shooting in the face a man or a woman who is begging you for mercy? Killing your mother? Shooting a six-year old with an assault rifle 11 times? Things that indiscriminant mass murderers do go way beyond the pale, as far as normal human beings are concerned. The overwhelming majority of humans are incapable of treating other human beings in this way. Perhaps only 2 or 3 percent of human beings are ‘sociopaths’ who lack such inhibitions and to whom killing another person is no more stressful than stepping on a cockroach. The Army recruits their best snipers from this small minority. On the other hand, Cramer goes too far because there are literally millions of people in the US who suffer from some kind of mental problem (“in the early 1980s, there were about two million chronically mentally ill people in the United States”). Nevertheless, only a tiny minority of them commit mass murder. In the retrospect, we say – aha! – Adam Lanza had been diagnosed with Asperger’s syndrome. This explains why he murdered 27 people including 20 children and then committed suicide. It actually explains nothing. This is the first time I heard of Asperger’s syndrome, and I had to look it up. It turns out that it’s a mild form of autism, and apparently there is no connection between this condition and an increased propensity for violence. Check out the New York Times opinion by Priscilla Gilman, Don’t Blame Autism for Newtown for more details. If it could be shown that the number of mentally ill people increased in parallel with the frequency of IMM, that would indeed be a viable alternative explanation. Many, including Cramer, point to the shift in the treatment of mentally ill during the Reagan administration. But the curve of IMM incidence doesn’t show a threshold-type behavior we would expect, if this were the primary cause. As my fellow editor Mike Hochberg pointed out, where are the data? Can somebody show me how the numbers of chronically mentally in the US changed over the last four decades? 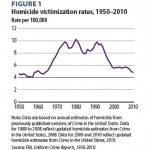 Furthermore, Cramer points to the observation that the homicide rate in the US declined during the 1990s, and that it coincided with the so-called “incarceration revolution.” The implication, as I understand, is that a lot of criminally insane were locked up and the result was decreasing murder rates. Fine, but the incidence of IMMs actually accelerated during the 1990s. More generally the divergent trends between homicides and IMMs presents a serious difficulty to any alternative explanation. 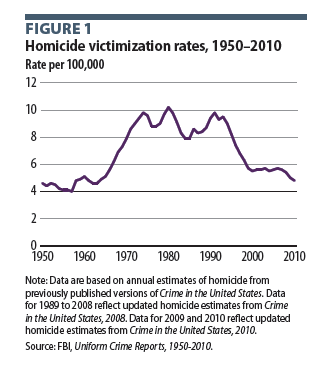 If IMMs are simply another type of homicide, why did the overall murder rate declined, starting in the 1990s, while IMMs kept on trending up? Note that there is no contradiction between Duwe’s data and mine because we use different criteria and thus count different types of events. Duwe counts any murder that caused 4 or more fatalities, including criminal and family disputes, while my primary criterion is indiscriminancy, meaning the application of the social substitutability principle, and at least one fatality. But the divergent trends between homicides and IMMs are a serious problem for any alternative explanation. It is not a problem for the structural-demographic model because it posits that homicides (crime) and political violence are distinct conceptual categories, and it is not necessary for them to move together. While they share some of the causal factors, other drivers are different. In historical data for the societies that I studied homicide rates and political violence rates do not necessarily move in parallel. Whatever reasons caused the homicide rate to decline in the 1990s, the structural-demographic processes of popular immiseration and elite overproduction have continued to trend up, and so we expect that political violence should have also gone up (which it did). I have already discussed this alternative explanation in my response to Bryan Vila, but let’s recapitulate the main points here. 1. I agree that the media coverage plays a role in the epidemic of IMM. However, this mechanism works together with the structural-demographic explanation. It is not an alternative hypothesis. In my analogy with a forest fire, structural-demographic conditions tell us whether there is enough flammable material, while cultural contagion mechanism explains how a spark that falls on the flammable material develops into a conflagration. Both are needed. 2. Cultural mechanisms are particularly important in determining how forms of political protest and political violence are ritualized. Which forms become part of the cultural repertoire of any particular social group. So when a Tibetan monk wants to protest oppression and injustice he goes to a public place and sets himself on fire. When an Arabic youth wants to do the same she straps on a suicide belt, goes to a public place, and blows up herself and whoever is nearby. When an American wants to do the same, he arms himself to the teeth, goes to a public place, and murders as many people as he can shoot until he is killed by the police. Does economic reasoning explain acts of madness? By this point it should be clear that I certainly do not explain IMM incidence by any kind of rational choice mechanism, which includes economic reasons. Murder-suicides are quintessentially irrational acts. As I explained earlier in this post, economic conditions, however, can change the environment in ways that may elicit more, or fewer such acts. It is ironic that my critic posted his disagreement in the Fall of 2008, before it was widely appreciated how serious the Great Recession was going to be. This severe economic downturn, then, can serve as a natural experiment testing the hypothesis that worsening economic conditions should result in an increased incidence of IMMs. 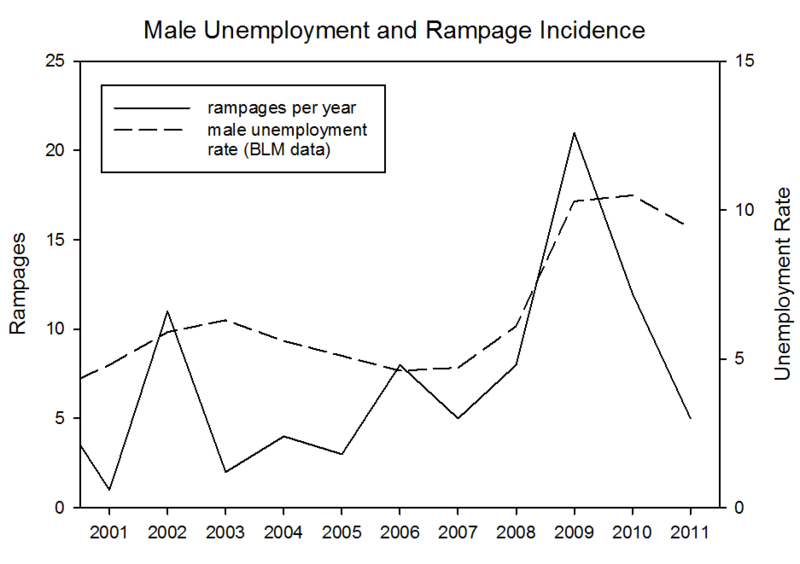 As we can see, the incidence of IMM tends to jump during years when male unemployment grows. In 2009, which was probably the worst year of the Great Recession, there were 21 rampages – more than during the entire two decades of the 1950s and 1960s (16 rampages). Originally Published on December 15, 2012 here. This entry was posted in Economics and tagged Massacres. Bookmark the permalink.